Tottenham cemented their place in the Premier League's top four but had to be satisfied with a point after they were held to a draw at Everton. Aaron Lennon's angled half-volley against his old club after 22 minutes gave Everton a lead that was completely against the run of play as Spurs dominated the first half. Harry Kane and Ben Davies both struck the woodwork either side of Lennon's goal before Dele Alli controlled Toby Alderweireld's superb long pass to volley low past Everton keeper Tim Howard in first-half stoppage time. Everton exerted much more pressure after the break as Spurs keeper Hugo Lloris saved superbly from substitute Muhamed Besic's 25-yard shot and Romelu Lukaku just failed to turn in Gerard Deulofeu's cross. The 19-year-old, signed by Spurs from MK Dons, has been the source of real excitement this season as Mauricio Pochettino's side suggest they are genuine contenders for a top-four place and even a serious title challenge. It was easy to see why at Goodison Park as the tall, athletic midfield man looked the complete package and a player who has a golden future for club and country. Alli looked a little leggy in the opening stages but showed he was prepared to mix it in the physical exchanges before growing into the game, showing superb technique to control Alderweireld's long pass and slide a composed, precise finish past Howard. Everton have arguably their most naturally gifted squad since the mid-1980s - so it has been a source of frustration that they have won only six league games, are 11th in the table and have failed to capitalise on the Premier League's unpredictability. Despite the presence of gifted young players such as Lukaku, John Stones, Ross Barkley and Gerard Deulofeu, there is an understandable sense that manager Roberto Martinez is seriously underachieving with the players at his disposal. It was reflected in the mood of impatience and frustration around Goodison Park, which was uncharacteristically subdued for large parts of the game, following successive home defeats by Leicester City and Stoke City. Nowhere is that fragile relationship between fans and players more in evidence than with keeper Howard. The American reacted to being sarcastically applauded for making a simple catch in the loss to Stoke and received similar treatment a couple of times against Spurs, as well as howls of frustration when he punched clear late on rather than claiming the catch. Martinez has big games coming up against Manchester City in the League Cup - they could shape his and Everton's season. Spurs boss Mauricio Pochettino: "It was a great game, very entertaining, but my feeling is I am pleased for the effort but at the same time the feeling is we dropped two points. "The first half was one of the best 45 minutes we have played so far, but we were a bit unlucky that Everton scored. "Our mentality is strong, we are ambitious. Goodison is a very tough place to come, Everton are a tough team. We need to feel proud. We always try and win the game, sometimes in football it is not possible." Everton manager Roberto Martinez: "I feel satisfied. We saw two very good teams who want to play in a similar manner. "We never lost the defensive intensity. It is not something we have had at home and it has cost us points, but my players were immense in that respect. They just could not find the final pass in certain moments when maybe they could get the winning goal." Everton scored with their first shot of the game. Lennon scored his first Premier League goal for Everton at Goodison Park in his 12th appearance there for the Toffees. Romelu Lukaku has been directly involved in 10 goals in his past six Premier League games at Goodison Park (seven goals, three assists). Dele Alli has scored or assisted six goals in his past seven Premier League appearances (three goals, three assists). Spurs are unbeaten in their past nine top-flight games on the road, winning four and drawing five. Everton have won just three of their past 13 Premier League games (W3 D6 L4). These two sides have both drawn a league-high nine Premier League games this season. 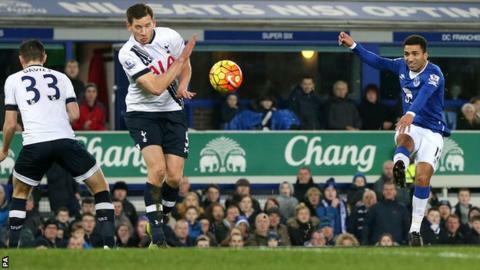 Match ends, Everton 1, Tottenham Hotspur 1. Second Half ends, Everton 1, Tottenham Hotspur 1. Attempt saved. Ross Barkley (Everton) left footed shot from the left side of the box is saved in the bottom right corner. Attempt blocked. Romelu Lukaku (Everton) left footed shot from the right side of the box is blocked. Assisted by Gerard Deulofeu. Attempt blocked. Ben Davies (Tottenham Hotspur) left footed shot from outside the box is blocked. Assisted by Son Heung-Min. Attempt missed. Romelu Lukaku (Everton) left footed shot from the left side of the box is too high. Assisted by Gerard Deulofeu. Attempt blocked. Son Heung-Min (Tottenham Hotspur) left footed shot from outside the box is blocked. Assisted by Josh Onomah. Attempt blocked. John Stones (Everton) right footed shot from outside the box is blocked. Assisted by Seamus Coleman. Substitution, Tottenham Hotspur. Josh Onomah replaces Erik Lamela. Corner, Everton. Conceded by Toby Alderweireld. Attempt blocked. Erik Lamela (Tottenham Hotspur) left footed shot from outside the box is blocked. Assisted by Kyle Walker. Attempt missed. Ramiro Funes Mori (Everton) header from the centre of the box is close, but misses to the right. Assisted by Tom Cleverley with a cross following a corner. Corner, Everton. Conceded by Hugo Lloris. Attempt saved. Muhamed Besic (Everton) right footed shot from outside the box is saved in the top left corner. Attempt saved. Dele Alli (Tottenham Hotspur) right footed shot from outside the box is saved in the top centre of the goal. Assisted by Son Heung-Min. Corner, Everton. Conceded by Ben Davies. Attempt blocked. Gerard Deulofeu (Everton) right footed shot from the right side of the box is blocked. Assisted by Romelu Lukaku. Offside, Everton. Leighton Baines tries a through ball, but Ross Barkley is caught offside. Substitution, Tottenham Hotspur. Son Heung-Min replaces Christian Eriksen. Attempt blocked. Tom Cleverley (Everton) right footed shot from outside the box is blocked. Gerard Deulofeu (Everton) wins a free kick in the defensive half.